Claymakers Gallery specializes in contemporary studio pottery and ceramic art. Changing exhibits feature the diverse work of our region. 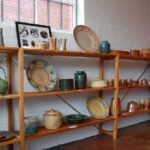 North Carolina has a long history in the clay arts, with a wealth of exceptional ceramic artists and potters who are national leaders and teachers. Claymakers Gallery makes their work available in the Triangle through special exhibits featuring invited artists, as well as through regular showing of artists in Claymakers’ immediate community. It’s the perfect place to explore the possibilities of clay — and to find a unique gift!